It seems like this post is the only one I really have time to write every week...yikes. With this house selling journey, I feel like I spend all non-working hours cleaning and organizing. That's okay, though...just grateful to have a house to be selling in the first place! Let's have some Confessional Friday fun, shall we? 1. I confess that, although I'm excited to get into a bigger home, I'll be so sad to leave our little neighborhood. It's kind of sad to think of how many memories we've made in this home. And we just feel so comfortable right here. But, we are completely out of room now that Caroline is in the picture. We had a small home to begin with, which was fine, but now we are just overrun with stuff! Anyone else out there feel like their house shrunk the minute they had a kid? 2. I confess that I have printed nearly every recipe from last week's recipe link-up! 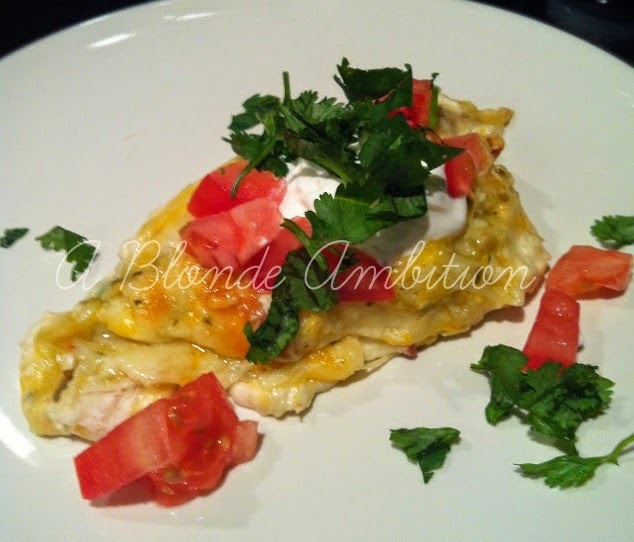 In case you missed it, we did a special recipe link-up on Friday. All of them looked and sounded so good. I think my summer cooking routine is getting a much-needed change-up. 3. I confess that I got a little misty-eyed after snapping some pics of Caroline earlier this week. 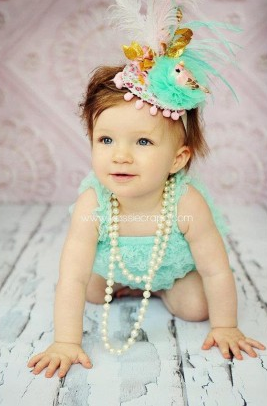 It's so sad that she'll be EIGHT months old in just a couple weeks. I swear, I just had her! 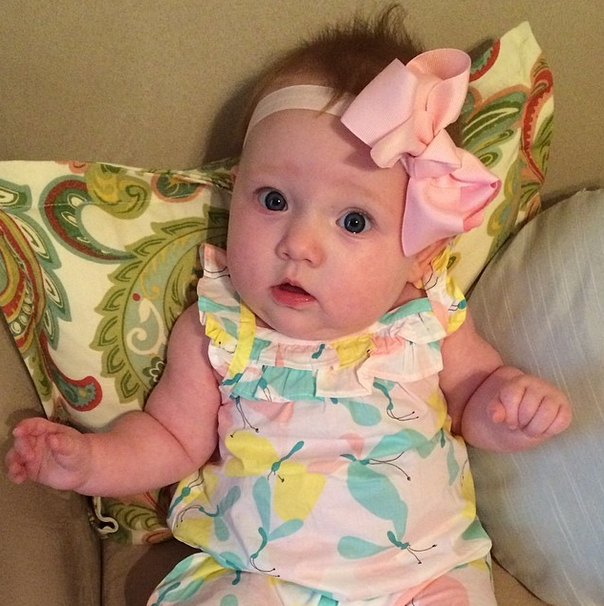 Why do babies grow so quickly? It just shouldn't be allowed! 4. I confess that my summer wardrobe is in definite need of a boost. Summer isn't my most favorite season to dress for, (I much prefer cute sweaters, boots and jeans.) But, since I'm not working out of the home as much right now, I'm going to need some cute day-to-day items to get me through the warmer months. I'm pretty sure this is an assignment I can handle ; ) Shopping. It's a tough job, but someone needs to do it. I'm going to age myself saying this, but everything is SO cropped, and SO short and SO....appropriate for an 18 year old. It's like you either have to dress like a teenager, or you're stuck with the dreaded mommy Bermuda shorts. I may as well buy some Croccs. (Except not really. If I ever wear Croccs, please put me out of my misery.) What gives? Maybe I'll do a post on dressing for summer and still maintaining some modesty, ha! Okay girls, tell me what's on your minds! Ruffles. Frills. Lace. Poofy things. Twirling. Fluffy skirts. All things synonymous with being Mom to a little girl. And I puffy-pink-heart LOVE every moment of it. 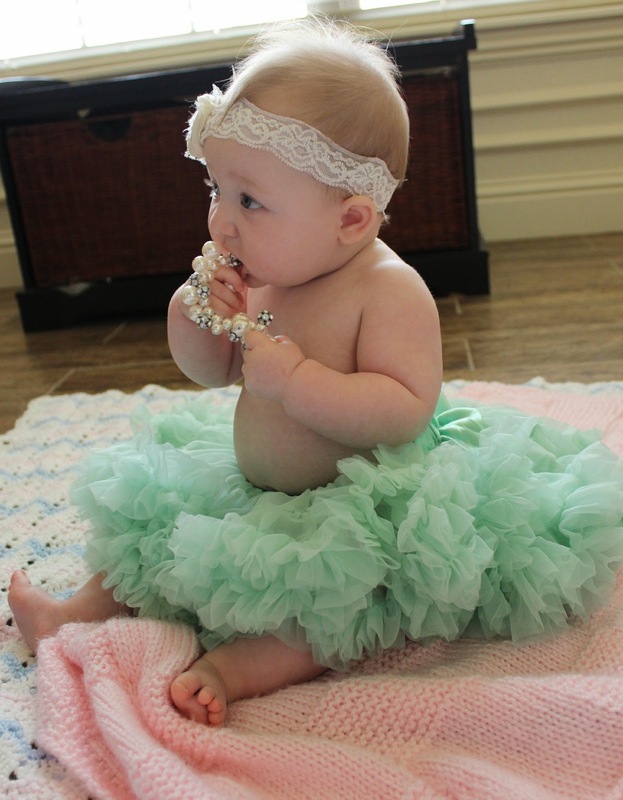 You can probably imagine my excitement when McKinli, awesome entrepreneur and fellow momma who is behind Mommy's Little Sunshine, emailed to see if I'd be interested in sharing her Petti Skirts with the blogging community. After 1.5 seconds of thinking, I answered with an enthusiastic 'yes'! 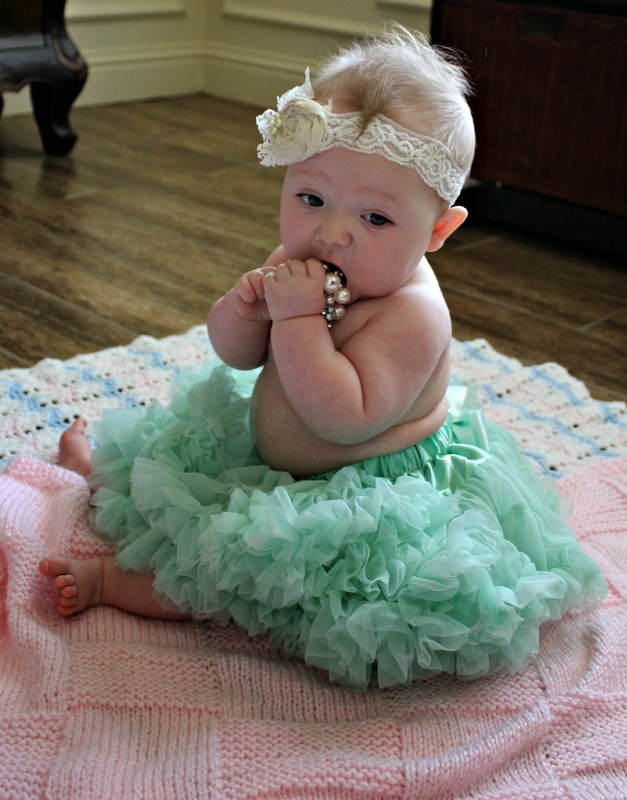 I had some time over the weekend to dress up Miss Thang and let her be all cute and babyish while I snapped a few pics. Oh. My. 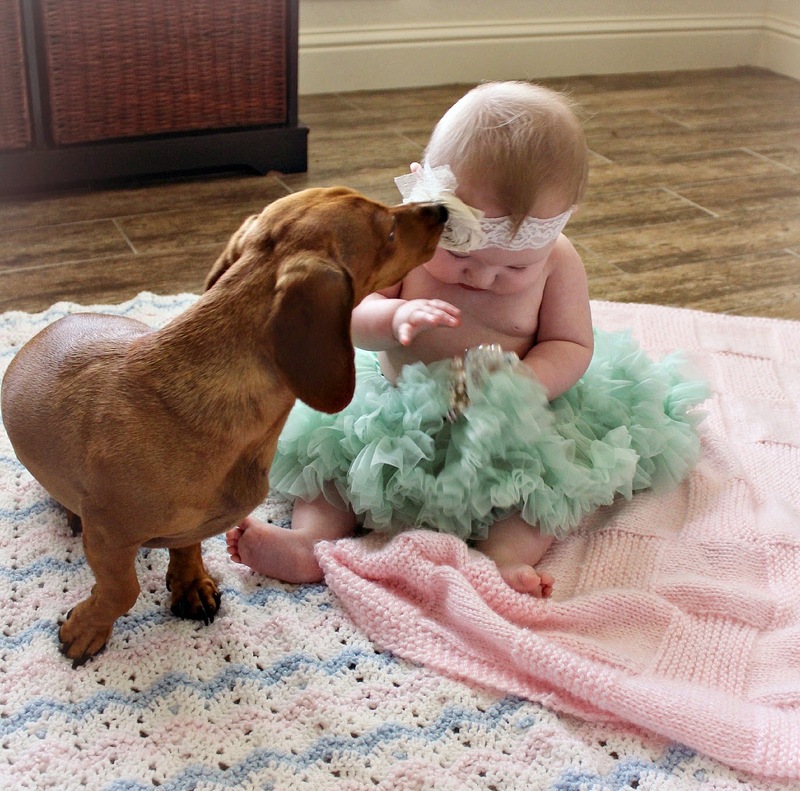 The preciousness was too much to handle. 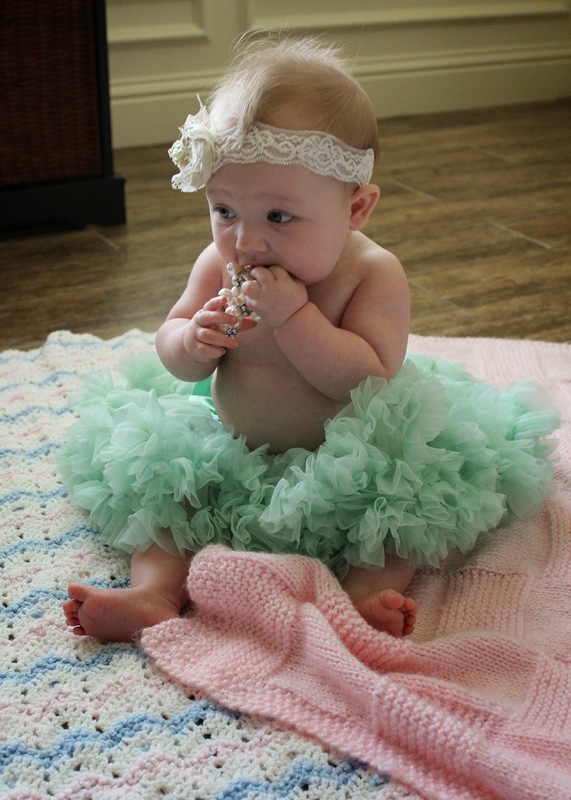 I had been wanting some super girly pics of Caroline for a while, so this Petti Skirt and coordinating head band were the perfect attire for her to wear. I love the beautiful (and perfect for summer) shade of aqua, too! 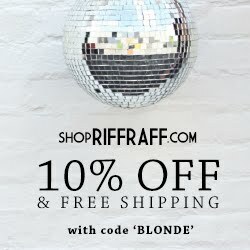 I love, love, love this store and wanted to share with anyone out there who may have a little girl, niece cousin, etc. 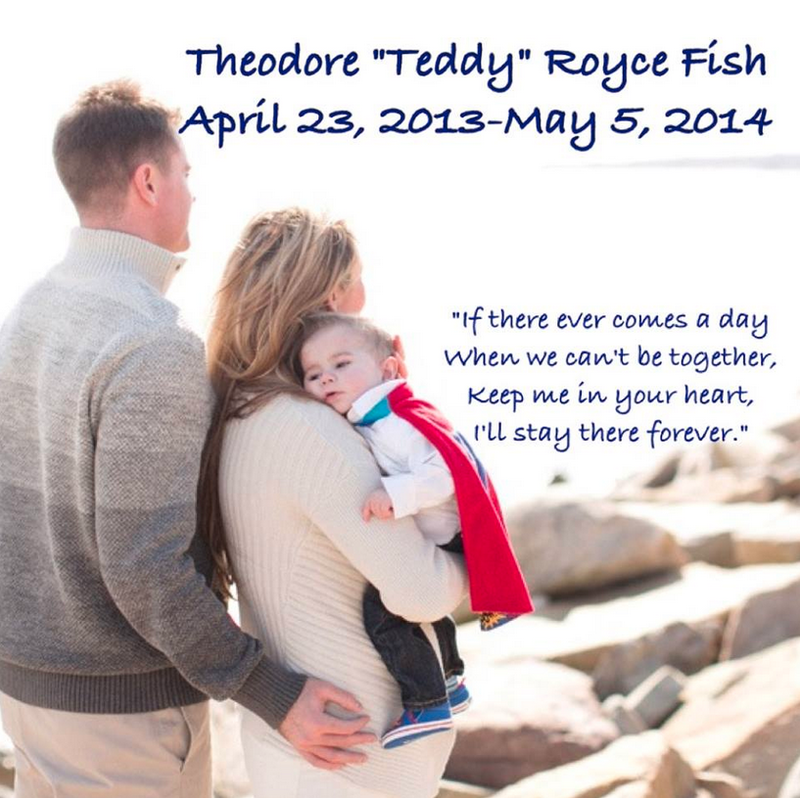 These would also make the BEST baby shower gifts! 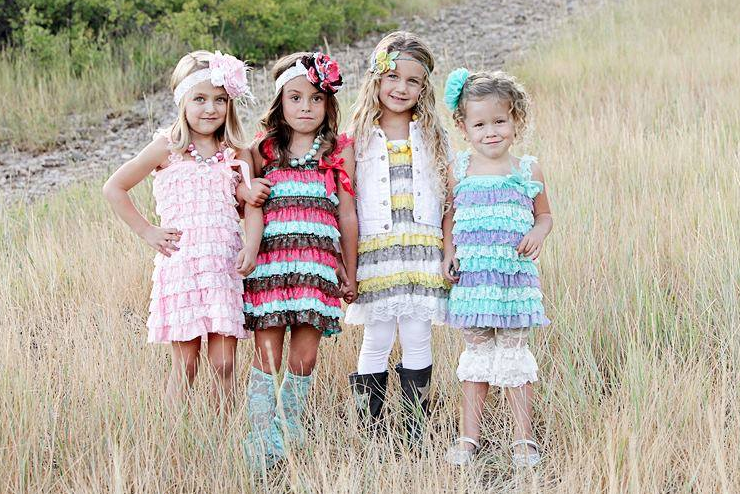 Check out Mommy's Little Sunshine for your next frilly, girly gift! 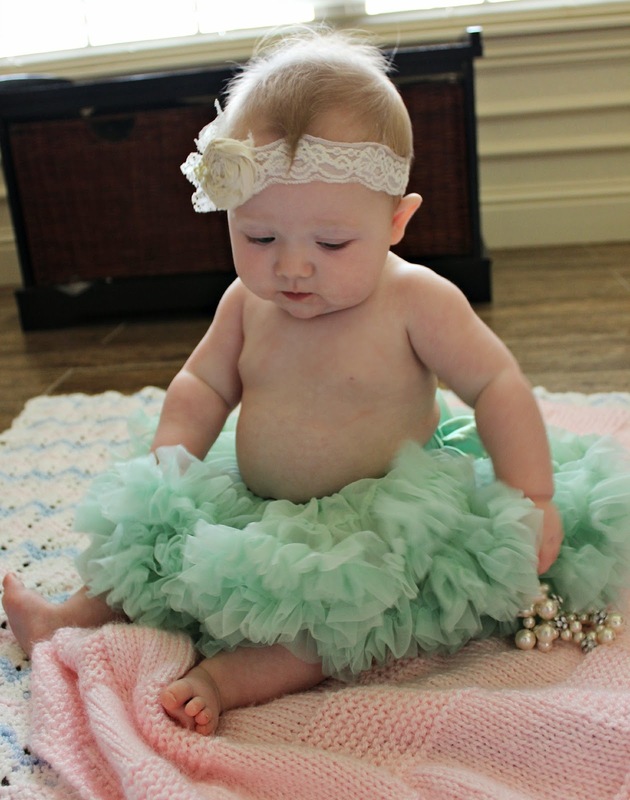 *The skirt and headband in this post was generously gifted by Mommy's Little Sunshine. Opinions are my own. 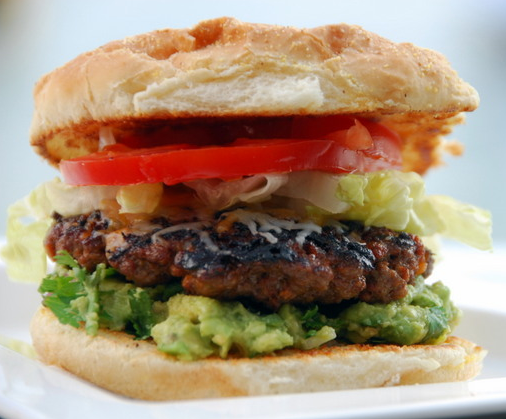 Come one, come all - it's a special edition of Confessional Friday: easy dinner recipes! I'll spare y'all the small talk and get to the goods. Preheat oven to 350 degrees. Boil chicken in a large pot. When chicken is done, remove from pot, keeping water/broth at a boil. 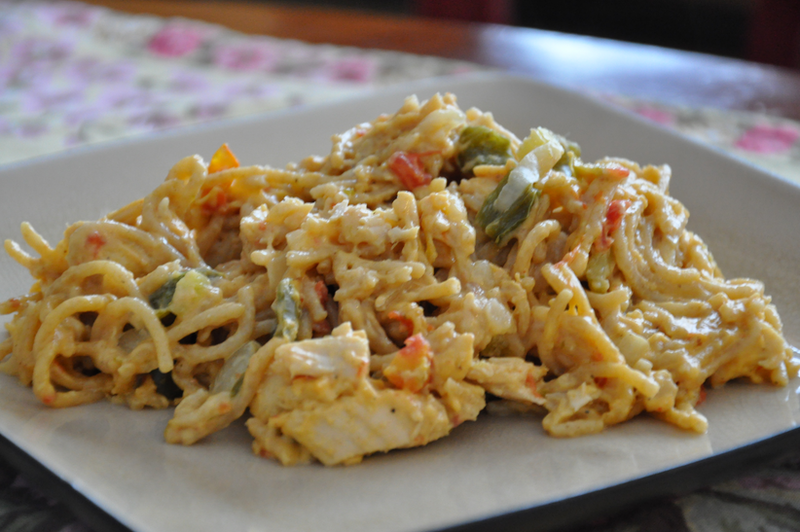 Shred chicken and set aside. Put spaghetti in boiling chicken broth and cook for 8 to 10 minutes, until al dente. When done, drain broth. Return pot with cooked spaghetti to stove, put over low heat. Add shredded chicken, soup, diced tomatoes with chile peppers and cheese. Pop into a casserole dish and stick 'er in the oven for 20-30 minutes until everything is nice and bubbly. 1. Boil chicken breasts until done. Shred and cool. 3. Mix chicken breasts, cream cheese, green chiles in bowl. Grease the bottom of a 9 x 9 casserole dish and apply a layer of chicken mixture to the bottom of it. Optional toppings: lettuce, tomato...whatever you want! 2. Grill, covered, over medium heat or broil 4 in. from the heat for 7-8 minutes on each side or until a thermometer reads 160 degrees F and juices run clear. 3. Apply toppings and enjoy! I can't wait to see what recipes you have in store for me! Annnnnnd...GO! Hey, friends! Checking in a little later than usual this morning, as I've been hanging out with my momma. 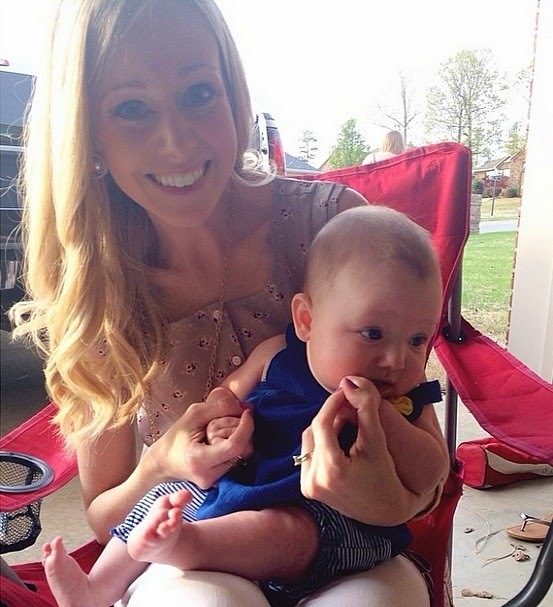 She came down last night to watch Caroline while we went to the Dave Matthews concert in Tulsa! What a blast that was. Seriously, does Dave ever not put on a helluva show? 1) If you follow me on Instagram (my username is ablondeambition) you probably saw these pics yesterday, so I apologize for the repetitiveness. I did soft waves for the show last night and was pleased with how they turned out - so easy! 2) Y'all excited for the special recipe edition of Confessional Friday tomorrow? You should be. I am. Get ready to link up and share your favorite easy dinner recipes. 3 ) Our house officially goes up for sale next Tuesday and I'm SO ready. I'm hoping we sell relatively quickly, but we will see. We have a couple houses picked out that we'd like to tour, so fingers crossed that this one sells and we get to put an offer on another. 4) I had heard that the e.l.f. brand of blush/bronzer was super comparable to NARS and - WOW - is it ever. I bought the e.l.f. 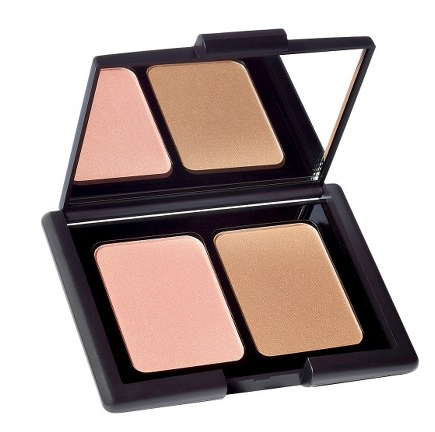 Contouring Blush & Bronzer in St. Lucia and loved how it gave subtle, sunkissed color for last night's concert look. I think it will be a summer staple. What are you gals up to today? Big plans for Memorial Day weekend? 2) I confess that I'm beside-myself-excited for date night tonight! One of the girls from Caroline's daycare is coming to take care of her and I'm so excited. Our daycare experience hasn't been the best, but Maria (or St. Maria, as we refer to her) has been the one beacon of light that came out of it, haha! Caroline loves her and Maria takes awesome care of her. 3) I confess that I would really like an Egg McMuffin write now. You know those people who are all, "Ewww, McDonald's. I would never!" Well, that's not me. I'll proudly admit that I'm not above a delicious McMuffin or large order of piping hot Mickey D's fries. Judge away. 4) I confess that I have proudly kept our house clean for one full week. The realtor is coming on Monday morning to photograph our house, so I've been trying to get in the habit of keeping it "show ready". It has darn near killed me, but darn it, I've done it. Let's all hope for a quick sale. Alright, girls! Your turn. Confess to me. It's Friday Eve! And, if that isn't reason enough to celebrate, I don't know what is. 1. 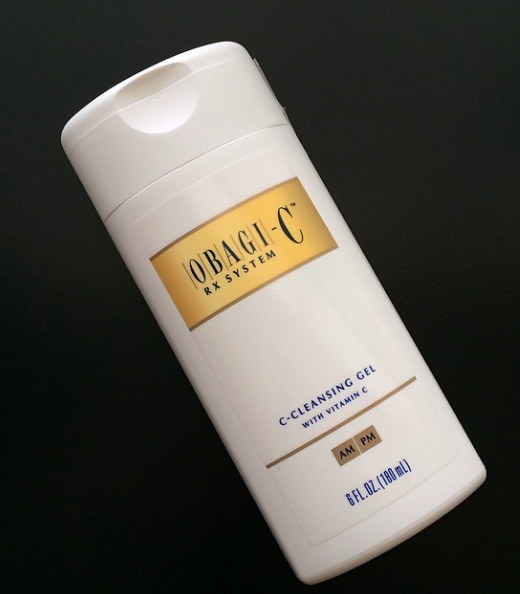 I was finally reunited with the best cleanser ever yesterday, Obagi-C's C-Cleansing Gel. I found it on Amazon, naturally. One of my roomies in college worked for a dermatologist who sold the stuff and I was hooked. I had trouble finding it for a while, so I switched back to Mary Kay's Timewise Cleanser, which I still like a lot. But this stuff makes my face feel SO clean. 2. 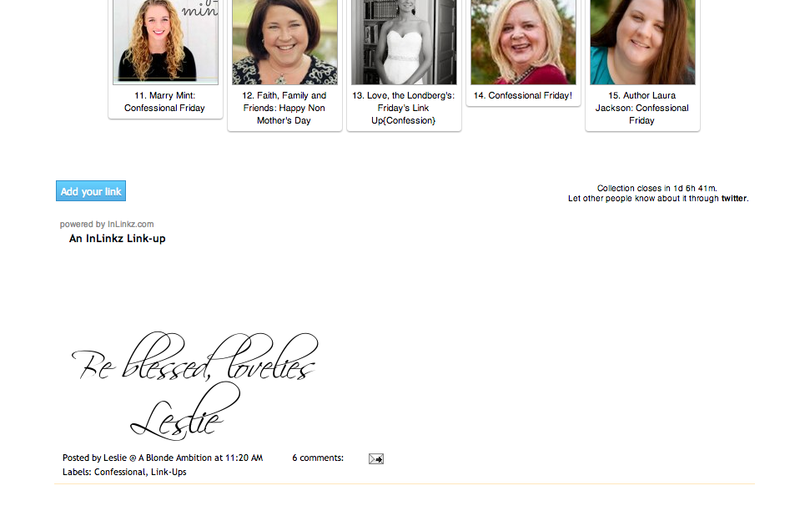 How would y'all feel about turning next week's Confessional Friday into an easy dinner recipe link-up? Like, maybe we each post two or three recipes that are staples in our homes, then link up to share? I'm stuck in the dreaded cooking rut, so I need some new culinary inspiration. 3. 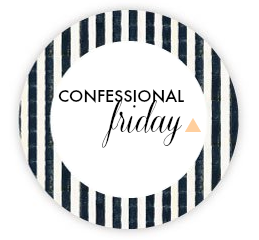 I've had a couple emails from folks wanting to know how to link up for Confessional Friday, so I thought I'd give the run-down for anyone else out there that's new to link-up participation! -First, you'll just type up your Confessional Friday post. Just "confess" anything you'd like. The key is to have fun! (And keep it light.) I don't want to know if you've committed any felonies or have any weirdo fetishes. Let's just keep that to ourselves, m'kay? -After your post is written, you'll come back here to my blog. 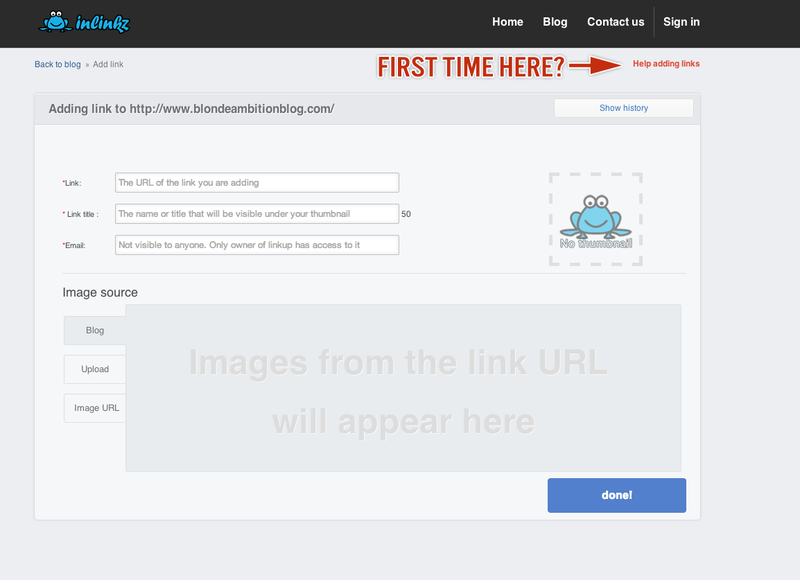 At the bottom of my Confessional Friday post here, there will be a blue button that says (fittingly), "Add your link." -During the step above, you can also select a thumbnail image, if you wish to display one. You don't have to, though. But, by all means, we'd love to see your beautiful face! -That's it, gals. You're in like Flint. Well, that's about as exciting as it gets, isn't it? I do hope you'll be able to compose yourselves and get on with your day after this enthralling blog post. Back here. Tomorrow. Same time. Same place. I'll bring the words, y'all bring the...anything. Anything you'd like to bring. Weight/Length: About 15 lbs. and hanging out around 24.75 inches long. 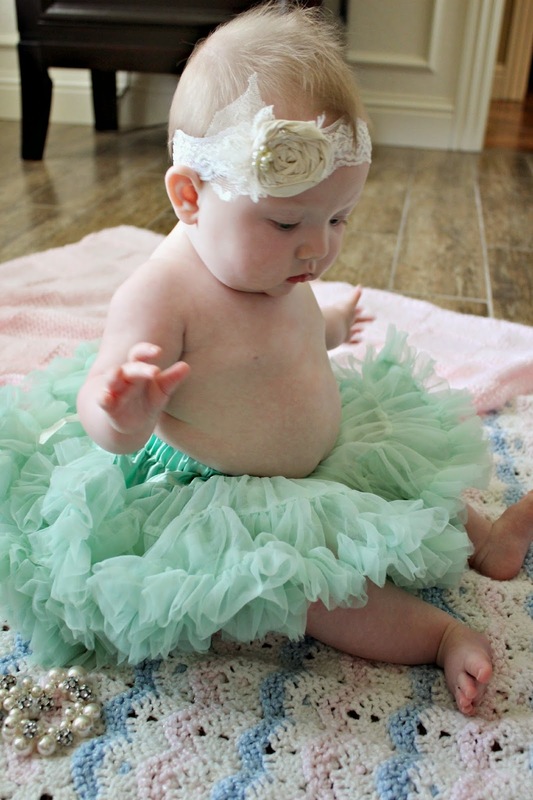 Girlfriend is rocking all those delicious baby rolls on her legs and arms. I may or may not be guilty of squishing her little legs while I'm rocking her to sleep. Hair and Eyes: Brown hair and blue eyes. Her hair got lighter for a while, but has started to darken again, so I think she'll be a beautiful brunette! Clothing: She can still easily wear 3 mo. tops. 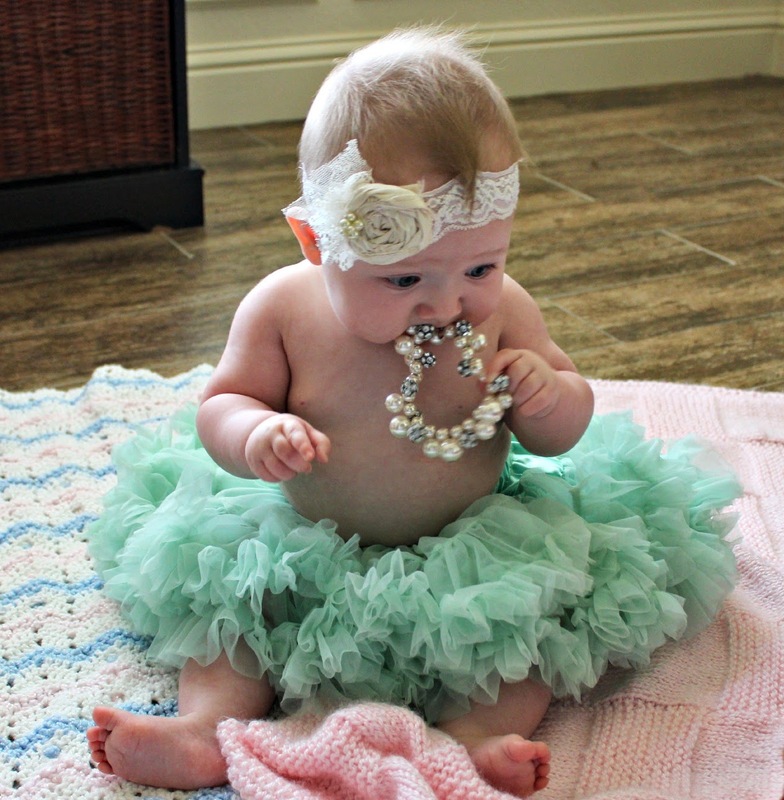 Most of her rompers and bubbles are 3-6 month. 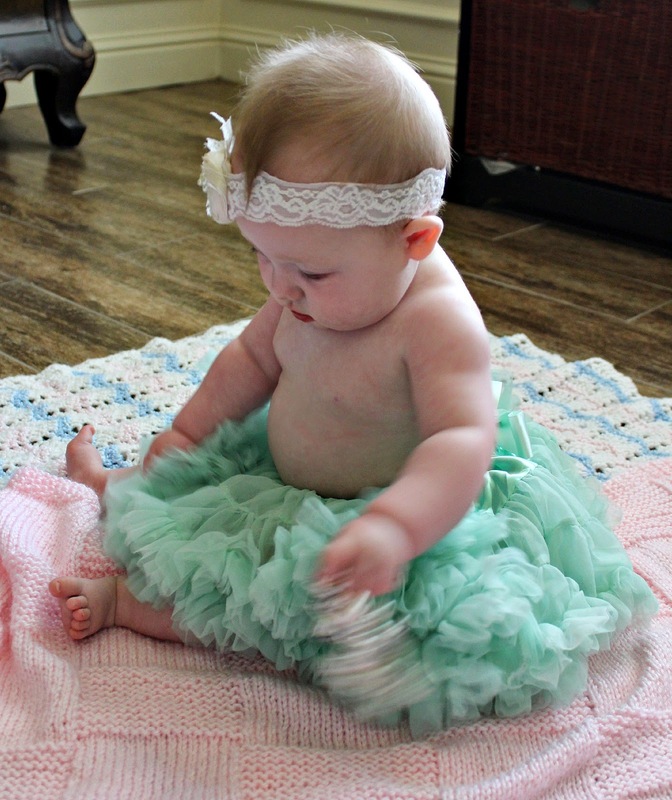 Dresses are pretty much whatever - she can wear 3 month or 6 month sizes in those. Favorite Things: Her Disney Baby Einstein Exersaucer, playing with these little silicone dipping sauce bowls, her singing bunny rabbit that her Nana gave her, as well as this (practically antique) play rotary phone that I had as a kid. 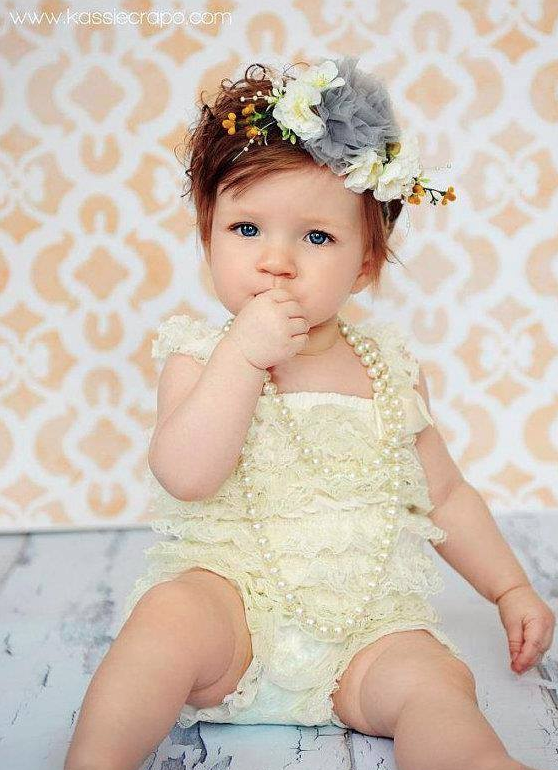 Likes: Right now, our petite princess loves: sitting up, standing up with support from mom and dad, riding in the shopping cart like a big girl, Mickey Mouse Clubhouse and being around her doggies. Milestones: Well, I suppose we can count eating solids, but she hates them : ( We're sticking with it and it is getting a bit easier. I think it's just a texture thing, still. She is starting to army crawl and scoot using her elbows and knees. Now that we've mastered sitting, we're starting to become mobile! No teeth yet, and I'm a-okay with that! A dentist friend told us that the longer they take to peek through, the better. Month six was so much fun. She was fun before, but now she has just come alive! 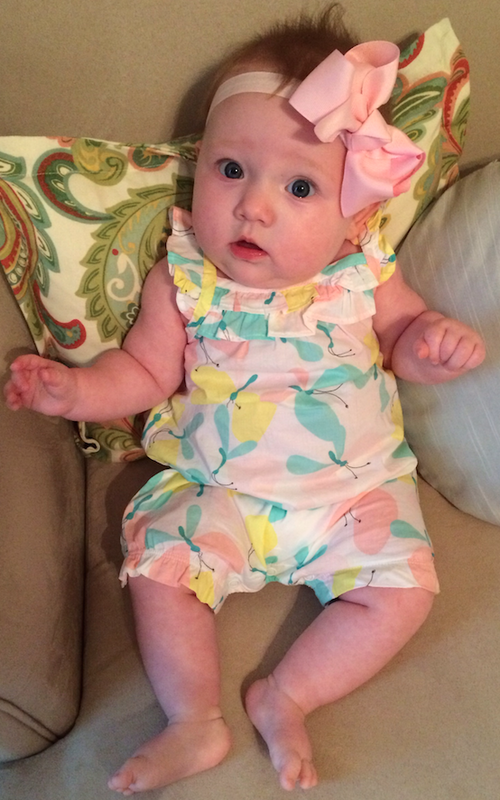 She squeals, laughs, smiles and reaches for people, (mostly her momma...and I don't hate that!) Her personality is becoming more and more evident, which is pretty cool to see. She has also started recognizing certain people and that's fun. We FaceTime all of her grandparents and every time my mom (her Nana) gets on the phone, her head will turn and she'll give the biggest grin. She is also super intrigued with Stephen's dad, her BopBop, which is hilarious. She will sit on his lap and just stare at him and grin and giggle. It's so funny! Mother's Day was downright amazing this year. (Well, duh. Because I was a mother.) Caroline "gifted" me with a new pair of sandals and a bouquet of pretty roses. She also took me out for breakfast with the help of her daddy ; ) The two of them make my world go 'round. I feel like I do some sort of “stop tanning now” post every year, but guess what – you need to stop tanning. And this is coming from a former tanning bed lover. With the warmer weather approaching, we’re all going to need to get a little color before rocking the shorts. I, however, choose to get my color via spray tanning. Years ago, I swore off tanning beds for good. And I’ve never gone back on that. (Fun fact: I actually worked in a tanning salon during college and, after seeing women come in who had tanned for years, decided I’d stop. Seriously. I didn’t want to look like that.) Funny that it took working in the industry to make me want to quit, but that’s how it worked out. 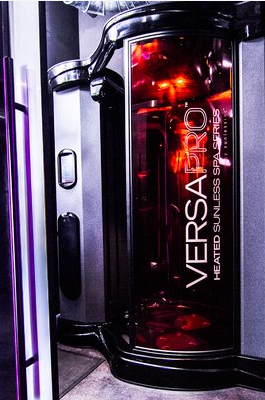 Nowadays, I rely on Versa (a spray tanning booth) to give me color. It’s not cheap, (my salon is around $27 a session), but if you know a few tricks, you can stretch out the time between sessions to get the most bang for your buck. I should note, I've used the Mystic system before, but after being introduced to Versa last fall, I much prefer the color it gives. -The day of your spray tan, take a shower, shave your legs really well, then use a salt or sand scrub over your entire body, including your feet. -After your session is over, ask to use the restroom and wash your hands really well, making sure to scrub in between fingers and on the palms of your hands. This will ensure that you don’t end up looking like you dipped your mitts in Tang. Now…wait. They’ll tell you to hold off on showering for six hours. I say, “hogwash!” Wait until the next morning. Yes, you’re going to smell a little funky crawling into bed that night, but that tan will stick around far longer if you’ll hold off for 12 hours on a shower. So, that’s it. How I stay tan during the warm months without actually having to, well, get a suntan. *Versa Tanning System doesn’t know me from Adam. I just really like their tanning system as a UV-free alternative and thought I’d share my tips with you all. Sorry for the tardiness of this thing. It's been quite a morning around Casa de Sisti this morning with barking dogs, a hollering baby and a work assignment that needed to be done, like, yesterday. 2) I confess that I don't think I've ever been as excited for a concert as I am for the Dave Matthews show in Tulsa on May 21! I bought the perfect breezy little concert dress, we have Nana lined up to keep Caroline and we're already scoping out good places to eat beforehand. Bring on Dave! 3) I confess that Caroline's hair has a life of its own and I freaking love it. Girlfriend has thick, brown hair and it refuses to lay down on her head, ha! I love it, though. It's so reflective of her spunky little personality. I hope it never changes color and that it always reflects her fun little personality. Short and sweet today, gals. I hope everyone has a great Mother's Day weekend! I love reading blogs, following them, sharing my favorites with friends. And, of course, I quite enjoy writing one of my own. But, in the midst of all the style-focused content, I still loved to connect with readers on a different level. I liked to write from the heart and have the occasional deep discussion. 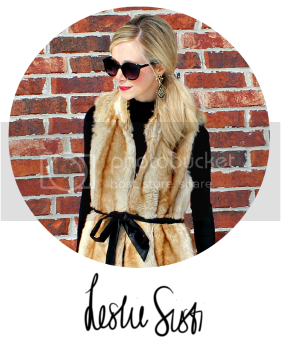 I think, amid all the skirts and peplum jackets, I longed to turn this web address into something more. After I got married, I wanted to write about other things: relationships, family, faith, my job and pregnancy. For these are/were the things that made my world go 'round and 'round. They lit my fire every day and made me want to write words. I had finally given myself the grace to just be me. Don't get me wrong; I love putting together a cute outfit, or filming a hair tutorial and occasionally sharing it with the web world. But, at this place in my life, it's not what gets me out of bed in the morning. And, it's certainly not what drives me to keep writing on here. My priorities have changed. This isn't some mission statement to say that I'm changing the direction of the blog. In fact, what you've seen in the past few months is precisely what you'll continue to see: motherhood posts, outfit photos, random thoughts, Confessional Friday, recipes, etc. I'll certainly post the occasional outfit photo and we'll be talking summer trends here. 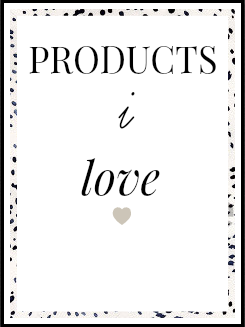 Fashion and hair and make-up will always be a part of this blog because those things truly are something I enjoy talking about with you all. But, I've enjoyed writing on here more in the last couple months than I ever have. I feel a bigger connection to all of you. And, isn't that what a having blog is all about? I think so. 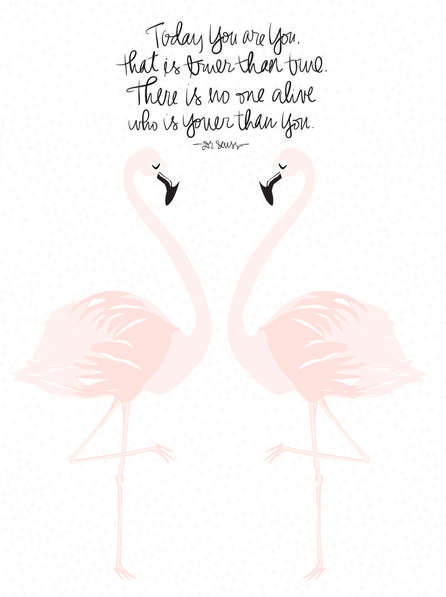 It's empowering to be yourself, isn't it?